The Salvadoran Archbishop Oscar Arnulfo Romero was murdered “in hatred of the faith.” The news comes in the preview edition of “Avvenire” for Friday, January 9, 2015. The members of the commission of theologians at the Congregation for the Causes of Saints gave their unanimously positive vote about the martyrdom suffered by the Archbishop of San Salvador March 24 1980. It is a decisive step for the Latin American bishop, killed while celebrating the Eucharist and whom the people already acclaim as a saint. Now, according to the canonical practice for the beatification, next is the judgment of the commission of bishops and cardinals, and finally the approval of the Pope. The case, which began in March 1994 and concluded the diocesan phase the following year, landed in Rome in 1997, promoted by the postulator Monsignor Vincenzo Paglia. 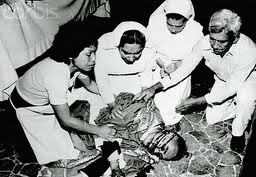 Pope Francis quoted Romero just in his last general audience: the archbishop of San Salvador, said Bergoglio, said that mothers live a “maternal martyrdom “. As the blurb indicates, after the theologians’ vote, there are still some formalities to be completed for beatification but, make no mistake, convincing the theologians is the biggest hurdle. If we had to think of a secular metaphor to explain the process and the significance of the theologians’ vote, we could think of it as similar to the jury process under U.S. law. If the jury finds in your favor, that is a major step. You may still need to have that verdict certified by the court clerk, and have the judge issue a judgment, but the “heavy lifting” is done. It is also significant that the report mentions that the nine theologians’ judgment was unanimous. This suggests that there is not necessarily a dramatic disconnect between those inside the Church and the outside world, where Romero has been very broadly accepted. It lends credence to the theory (espoused here) that the hesitation about beatifying Romero had to do with “prudential concerns” (in Pope Francis’ words) rather than with the merits of the case. The nine theologians’ unanimous vote will also make it very difficult for any remaining skeptics (of which there are a few) to argue that Romero is not deserving of the sainthood. Last month, this blog predicted that the decree for Romero’s beatification could come in the February-March time frame and this development is consistent with that scenario. The cardinals will be meeting on Feb. 3rd, when they will be considering the martyrdom of three clerics killed by Shining Path guerrillas in Peru--causes that raise similar issues to Romero. Therefore, it could make sense for the cardinals to consider Romero at the same meeting. If Romero was approved at this time, it would allow Pope Francis to present Romero's decree to the ordinary consistory of cardinals now set for Feb. 14. This would be especially useful if there is any serious thought about skipping beatification and going straight to canonization of Romero in El Salvador. In El Salvador, President Salvador Sánchez Cerén is reported to have promised that, if the Vatican declares Romero a saint and the ceremony is held in the country, he will invite every head of state of the hemisphere to come share his country’s joy. Foreign minister Hugo Martinez expressed the “jubilation” of the Salvadoran government at the news. Additionally, reactions have been abundant in the social media sphere. 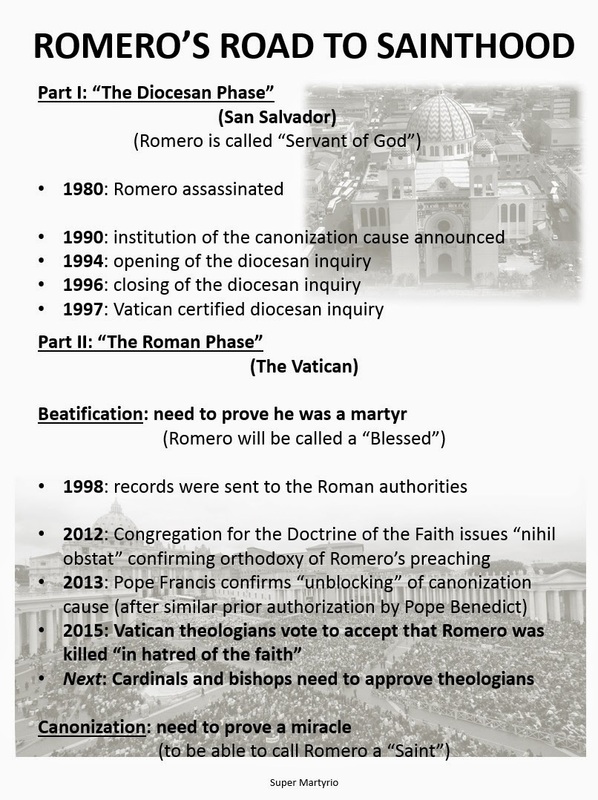 In San Salvador, the man who had been the postulator of Romero’s cause during the diocesan phase (see chart below for reference) was more reserved. Msgr. Rafael Urrutia tweeted a reminder that the vote of the theologians still needs to be confirmed by a commission of cardinals and bishops, and then approved by Pope Francis. “But this is great news that gladdens the heart, the Church, and those who love Archbishop Romero,” his statement said. The Romero Foundation in El Salvador posted on its Facebook account, "We hope that the official news will arrive soon!" Meanwhile, also in El Salvador, the local press reported that the Secretary-General of the United Nations, Ban Ki-moon, who will be in El Salvador to commemorate the anniversary of the Peace Accords that ended the 1980-1992 Civil War in that country, would visit Archbishop Romero’s grave next week.